What can I say, when the entire process of divorce started I was shattered. I was not in a very good frame of mind. I knew I needed an attorney but I had no idea where to start. I looked online & researched & read reviews as best I could. I called one attorney & spoke with a rep. & made an appointment. While I set the appointment I continued researching & I came across LaFrance Law, I'm very glad I did. I contacted the firm and was contacted by Shannon, by email first and then a phone consultation. From that moment on I knew I had the right person to represent me. I promptly cancelled my other appointment & never once looked back or regretted my decision. Through this entire process Shannon always had my child and my best interest in mind. She was firm with me when she needed & more importantly firm with opposing counsel when she needed to be. Never once through the process did I believe or feel that anything was done to drag things out for monetary reasons, quite the opposite in fact. She knew what a court battle would cost & tried to avoid that, never once compromising my interests. Very blunt and truthful. I am very glad I had Shannon on my side during this. Thank you again. Our experience with LaFrance Law Firm was truly AMAZING!!! 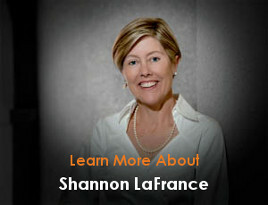 Shannon LaFrance is a very hard working, honest, caring, dependable attroney! She ALWAYS kept in contact with us, informed us on our options, was straight forward, didn't play games and made everything less stressful! We would HIGHLY recommend her and her law firm to anyone and everyone!! Shannon is detail oriented and owns the outcome. She is diligent, persistent and gives reasonable expectations of the outcome. Shannon does not give half measures of effort. She is extremely motivated and appropriately aggressive. Chris and his wife Shannon have been working a case for my daughter for over two years now. I cannot say enough good things about both of them. They are professional, caring and extremely thorough. Any time we had a question, they got back to us immediately are were able to break things down in a way that was easy for us to understand. We feel blessed to have them fighting for us. Shannon and her husband Chris did an outstanding job presenting the facts that were to determine the fate of our autistic grandson. Shannon never lost sight of the fact that this case was about the child. She and Chris were extremely well prepared with the true facts of the case. They left no stone unturned. I cannot express how grateful we are that we were directed to Shannon, especially after having had a terrible first experience with another firm in Tampa. Shannon and her husband are THE BEST! I’ve (unfortunately) dealt with several lawyers in the past for various issues. I always got the feeling they were just either trying to get me out of their office or off the phone as soon as possible. Messages weren’t returned, my concerns weren’t addressed. 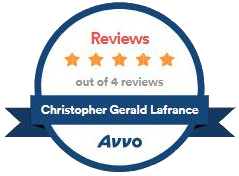 Chris talked to me in depth about all my concerns, gave me detailed, easy to understand explanations and was always ready to address any issue regarding my case in a timely manner. Talking to Chris I always got the feeling he was really listening to me as a human being, not just another case on the docket. He cared about the outcome of my case on a human level, not just on a business or legal level. I appreciated that and he and his team got me and my family through a very tough time in our lives. I don’t know if we would have survived it with another lawyer. I can’t say enough about his professionalism, his compassion and his competence. I know lawyers can’t guarantee outcomes of your legal case, but if Chris can’t get you a positive outcome, I seriously doubt there is a lawyer who can. Thank you, everyone at LaFrance Law, for the help and support you gave to me and my wife and kids. We’ll always be grateful. I would just like to thank Ms. LaFrance for everything she did for me during my dissolution of marriage. Not only was she very professional, it was obvious throughout the entire case from the first time I talked to her that this is more than just a job. She actually cares about you as a person; you are not treated as just another client. Her dedication far exceeded my expectations. Shannon, I just cannot thank you enough! Shannon LaFrance was excellent throughout our entire case. She is very honest, caring, and understanding. She always worked with us and was very reasonable. She was a pleasure to work with and I would recommend her to everyone. I hired Shannon in May 2015 for a case that lasted through to December 2015. I needed a lawyer that was very professional, experienced, and was available when I had questions or when important situations arose. Shannon was able to go above and beyond all of these things as she is a lawyer that gets the job done by working hard, giving honest advice, and who cares about her clients. I had the most important job of my life to hire an Expert lawyer that would help me for a life-shaking event in my life and Shannon was with me working hard every step of the way and we were able to get a positive outcome thanks to her hard work and dedication. I would definitely highly recommend and hire her again. This is important because communication is key! I’ve experienced attorneys in contract law, construction, estate planning, business and zoning law. 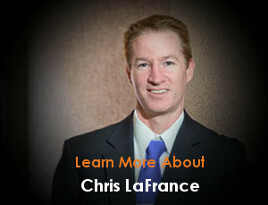 I also had the pleasure of working with Chris LaFrance in a detailed, family law matter. Of all my experiences, Mr. LaFrance was the most considerate and detailed in return communication and honest legal direction that allowed me to make informed intelligent decisions. Too many attorneys tell you want you want to hear. If you’re I’m need of family law and want straight legal advice in a timely manner, give Mr. LaFrance a call. I am happy to recommend Chris. He is the kind of attorney that tells it to you straight. He will explain all your options so that you can make an informed decision. He will then represent you with enthusiasm. He works in a practice with his wife of 20 years and they both are very experienced in Family Law.